The Hoffsicle: David Hasselhoff Ice Pop « Gluttoner: You gonna eat that? 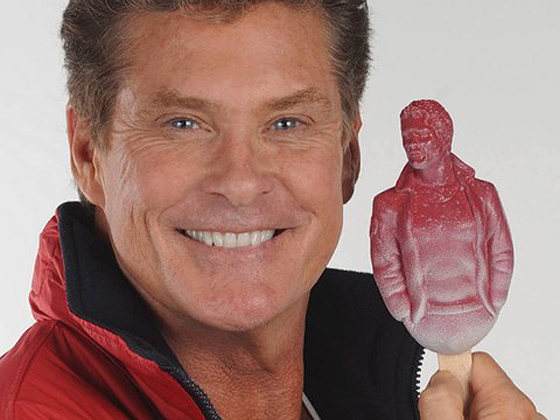 Knight Rider legend, Baywatch hunk, German pop star, and judge on both America and Britain’s Got Talent is now available in the lickable form- the Hoffsicle. Although some might argue that he’s always been lickable, and just writing that sentence has me feeling a bit nauseated, so we’re gonna go ahead and call this a diet aid. Created by Del Monte Iced Refreshments to defile celebrate National Ice Cream Month, the Hoffsicle is a raspberry-flavored frozen treat that’s a pure refreshing delight in your mouth just like the real Hoff. And again my appetite is lessening. Seriously that’s just gross. Don’t hassle the hoff(sicle).